Volume two of Monographs of the Aguateca Archaeological Project First Phase, Takeshi Inomata and Daniela Triadan, general editors. This archaeological report centers on findings at Aguateca, a unique site in the Petexbatun region of the southern Mayan lowlands that was unexpectedly attacked in AD 810. The subsequent rapid abandonment and burning of many of the elite and non-elite residences at the site provide archaeologists with an encapsulated record of domestic and political activities on the last day of occupation. The in situ artifact assemblages from use and storage structures enable the study of specific activities and allow them to be addressed in depth owing to precise spatial patterning of the assemblages, which differ significantly from those of gradually abandoned sites. 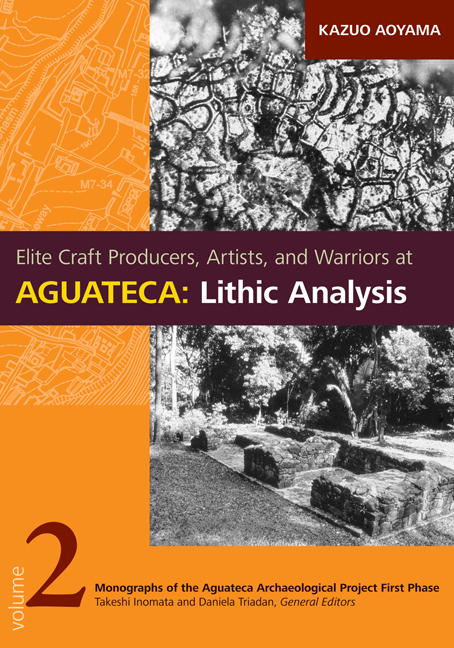 Elite Craft Producers, Artists, and Warriors at Aguateca uses the excavation data from twelve structures and various use areas to investigate artistic and craft production activities by elite men and women and warriors in Classic Maya society. Specifically, Aoyama focuses on detailed use-wear analysis of stone tools by employing high-power microscopy to address production, warfare, and the domestic and ritual lives of the Maya. He provides descriptions and discussion of over ten thousand lithic artifacts from the Aguateca site, which was a center of both utilitarian and luxury goods. Based on this research, Aoyama proposes that Classic Maya elite men and women artists and craft producers played multiple social and economic roles, such as scribes and warriors, as well as having administrative, diplomatic, ritualistic, and domestic duties. This view implies a more flexible and integrated system of Classic Maya elite participation in craft production than is usually proposed. Kazuo Aoyama is professor of anthropology and member of the faculty of humanities at Ibaraki University in Ibaraki, Japan. "Aoyama has produced an impressive analysis of stone tool use in the Maya lowlands that challenges many of the assumptions about the roles of elites in craft production in a positive and useful manner."